Start your next collage with an abundance of original material. 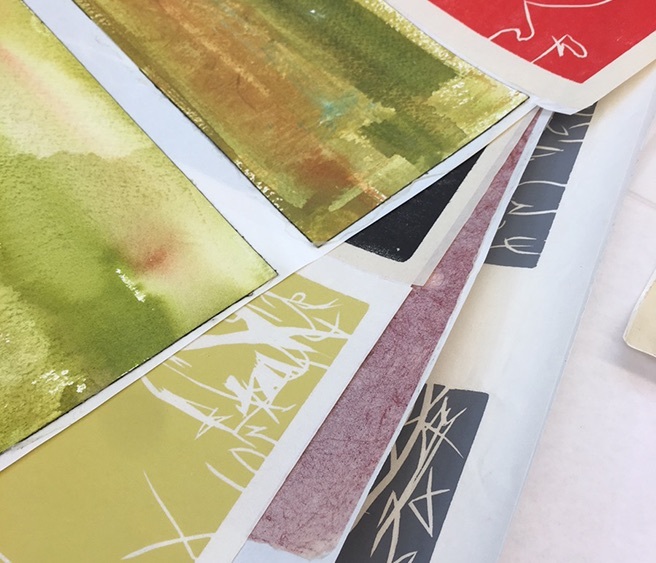 After three days spent in Sitka’s printmaking studio, students will have created a collection of papers to use in making their own collages. Students will learn techniques for applying both water and oil-based media to apply marks, gestures, patterns, textures and colors to a wide variety of papers. Both on-press and off-press techniques will be taught. Return home rich in original elements. Margot Voorhies Thompson is a Northwest painter, printmaker, calligrapher and the designer of the Sitka Center logo. She is represented by the Russo Lee Gallery in Portland, Oregon. Her public art commissions include installations at Portland State University, Woodstock Public Library, Doernbecher Children's Hospital, Oregon State Library, Tualatin, Kaiser Permanente, OHSU and the Oregon State Hospital. • Water color sticks, cray-pas, watercolors, gouache, etc. • Charcoal, water color pencils, etc.